[8.51 MB] Phil actually managed to pick a good strip. All three of us couldn’t help but completely over-analyze this strip and make completely random predictions. Also to make my life a living hell my laptop has decided to record a huge amount of ambient noise so loud you can’t hear Phil. I tried using noise removal but now it sounds like I’m in a cave. Hopefully you can ignore that annoyance to follow along with BOTG. After recording this review, we continued discussing the strip to the point where we figured out who the king is and were very proud of ourselves. Guys, I’m flattered. It’s been encouraging to see the response the book has gotten so far. The idea that anyone (besides myself) would task their brain cells analyzing and dissecting the story of Cerealia’s inhabitants is funny to me but it must mean I’m doing something right. FYI: There is no General Mills conspiracy. They just happen to own the monster cereals which naturally lend themselves to the casting of villains. In fact, there are some major baddies to come which owe their existence to Quaker. The “secret” to how the story and the characterization came about was just casting and extrapolation. Take the personality that the characters display in their ads and draw it out to its extremes. And some of the characters just fit a role I needed to fill (I needed a king, I found a king). Ayummayumma is a good example; he and his tribe are from a short-lived cereal from the ’80s called “Fruit Islands” and the idea dawned in me that they were the disenfranchised natives of Cerealia. Simple as that. Your predictions are pretty far off but it’s great that folks are trying. And I’m happy that the book is perceived to move “too fast” because there’s so much more I’ve got in the pipeline for issues 2 and 3 (can you think of characters you haven’t seen yet? rest assured I’ve got plans for ’em). Trust me, the story just gets bigger and bigger. Stay tuned! Oh, and issue 1 – “The Last Good Morning” – isn’t quite over yet. It ends on page 30 (but I agree, page 25 would have been a decent closer). I’ll close by giving you guys an exclusive (worth absolutely nothing) and that would be the names of the other two issues in the series. Expect these to hit the virtual shelves …er… someday. And thanks for the props! Great review guys and a great comic Brendan. I really like your approach. You guys are sooooo young. That’s what we figured out following the show, Joey. We were overly excited when we discovered it, too. Like we’d unearthed John Gotti. It’s inconsistent about Cap’n Crunch’s middle name (map says P.; cast page says Magellan), and there’s no forum or contact page. I only had King Vitamin twice in my life. This is a primal, unfocused memory. I might have been four or five. For some reason, I didn’t realize it was sugared, and put sugar on it. It tasted awful. I told my mom it tasted awful, so she never bought it again. Months later, at a friend’s house after a sleepover, I had King Vitamin again, noticed that he didn’t put sugar on it, and realized what I had done. I laughed and laughed. 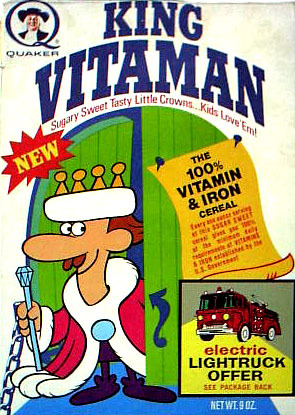 I still never had King Vitamin again, though. I wonder if the Kaboom! clown will show up? I similarly only tried Kaboom! a couple of times. That’s right, eagle eye (a.k.a. ralphmerridew), there is a discrepancy in Crunch’s middle initial between the cast bio and page 16. The research I had when I did Page 16 was later found to be incorrect and I discovered the official middle name (“Magellan”) later. One day, when I have the time to do some editing in Photoshop, I’ll correct Page 16. Get the next issue going please, i want to see Fruit Brute throw down against Super Bear!